COACH SCARE: Schoolchildren had to scramble out of a coach that left the road and capsized into a dyke in Moulton Seas End. Students from three Spalding schools scrambled their way out of a coach after it ended up in a ditch in Moulton Seas End. Dozens of schoolchildren had to make their way off the coach through an emergency door after it came off Seas End Road at about 4.20pm on Monday. TIGHT SPOT: This picture highlights the narrow nature of Seas End Road in Moulton Seas End. Photo supplied. The bus from Cropley’s Coaches, Fosdyke, was carrying students home from Spalding Grammar School, Spalding High School and Spalding Academy (formerly Sir John Gleed School). Eyewitness reports say its driver slowed down and tried to make room for a lorry coming towards it to pass when the incident happened. A message posted on social media by the coach driver, Kev Stone, said: “I was travelling at less than ten miles an hour before slowing more as the truck approached. “I didn’t move too far over to the verge and I was still a good 12 inches into the road when the camber (angle), along with the thick mud, took the coach sideways and slowly into the ditch. 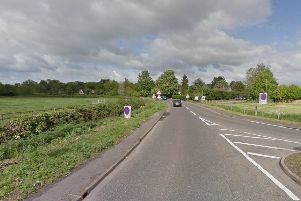 Dawn Adams, of Moulton Seas End, whose daughter was on the coach, said: “It wasn’t the driver’s fault as he was going at a very slow speed, as had been confirmed by all the children. “A lorry came towards the bus and the driver tried to pull towards the edge of the road and just skidded on the mud into the dyke. “The driver was a star as he made sure all the children were okay and he also stopped someone who was travelling behind the bus to help the children out through the bus’s emergency escape. “It was total chaos, with children dressed in dark clothing standing in the dyke and on the roads having climbed out of the emergency escape. Gareth Maddison, principal transport officer at Lincolnshire County Council, said: “The coach operator made alternative arrangements for the collection of pupils at the site after checking the welfare of all students. Police said they have passed details on to their collision investigation team to see if any further enquiries are needed. The Spalding Guardian approached Cropley’s Coaches for a comment, but none had been received at the time of going to press.